Every year Ulhasnagar waits for this gigantic Prabhat Pheri Event. There are many Gurudwaras in Ulhasnagar & each has their own followers and Prabhat Pheri schedules. 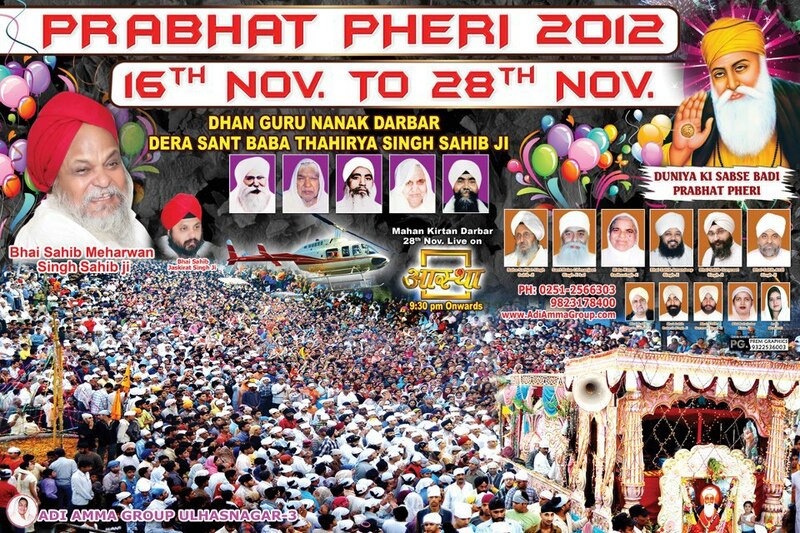 Prabhat Pheri organised by Dhan Guru Nanak Darbar Dera Sant Baba Thahirya Singhi Sahib Ji is worth watching. There is Prabhat Pheri every early morning from 16-Nov and size of people goes on increasing day by day until 28-Nov-2012 which is Birthday of Gurunanak Devji. This is celebrated as Prakash Utsav with world’s largest Prabhat Pheri of 2.5 lakh devotees. Live coverage of Mahan Kirtan is shown on Aastha TV Channel. Guru Nanak Jayanti Mubarak ho . On this auspicious occasion of the birthday of Sh.Guru Nanak Dev Ji, I wish to convey you all my heartiest congratulations…… Man Mein Sincho Har Har Naam. Kaho guru Ja Ka Nirmal Bhaag…daulat jadwani ulhasnagar. FROM PAST 25 YAEARS. ALL LIVE WITH LOVE AND CO- OPERATE EACH OTHER..